Tags: It is raining here in the Heartland as well though the view from my office window lacks a certain je ne sais quoi. Please Translate for me ? I read and speak NO French ! Well, Prof Pum, I believe that rain transcends all languages. 🙂 This is a view of the same street running parallel to the Seine that I showed in my last post. And je ne sais quoi? A certain indefinable quality that I can’t quite express. But it’s cool. Too too cool! Our apartment was on the 6th-7th floors, 8 Rue des Grands Degres with a direct view of the Rose Window and an incredible chorus of bells several times a day. Did the rain add to the enjoyment of the trip or detract? It seems kind of appropriate doesn’t it? It added to the whole experience. 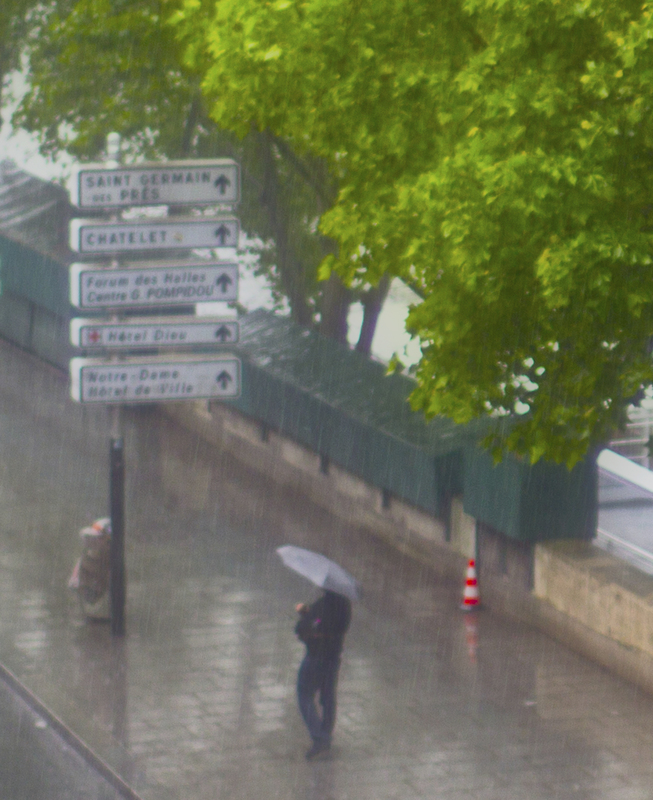 After hiding in sepulchers on Day 1, I discovered that you can buy umbrellas in Paris. Who knew?